I am a historian of science working on the history of environmental and evolutionary sciences in the twentieth century. I am interested in the ways in which scientific practices are affected by, and contribute to, social and political order. I published primarily on the history and politics of environmental data collection, the history of evolutionary biology, and historiography of science during the Cold War. I am currently writing a book on the intriguing history of attempts to integrate scientific knowledge and new technologies — from plant genetics to computers — into historical research. Most recently, I have co-edited (with Christine von Oertzen and David Sepkoski) a forthcoming volume of Osiris, “Histories of Data” (2017). I received my Ph.D. in History and Science Studies at the University of California at San Diego in 2012, after earning a doctorate in Biology and History of Science from the Russian Academy of Science. 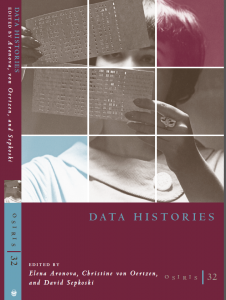 Data Histories, Osiris 32 (University of Chicago Press, 2017). Co-edited with David Sepkoski and Christine von Oertzen, the volume brings together a variety of perspectives in history of science under an emerging new rubric, the history of data. Thinking of data historically provides us with an opportunity to consider the impact of changes in cultures of information in the sciences in the longue durée, as well as to rethink important questions that cross many of our traditional disciplinary categories. Science Studies During the Cold War and Beyond: Paradigms Defected (Palgrave Studies in the History of Science and Technology, 2016). 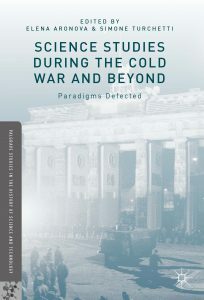 Co-edited with Simone Turchetti, this volume explores the Cold War politics of “science studies,” as an intellectual project and a community of scholars, in both familiar “battlefields” of the cultural Cold War (the US and Western Europe) as well as in less familiar contexts of Eastern Europe, China, and Latin America. “The congress for cultural freedom, Minerva, and the quest for instituting ‘Science Studies’ in the Cold War” Minerva, 50/3 (2012): 307-337. [Immunity: Theory, Philosophy, Experiment: Essays in the History of Immunology in the 20th Century] (Moskva, 2006). Through examining the history of the theoretical discussions in immunology in the second half of the 20th century, this book bridges an intellectual history of the Lamarckian tradition in evolutionary biology with a contextual analysis of the complex interactions between experimental and theoretical immunology, on the one hand, and between experimental immunology and philosophy, on the other (in Russian).